'Bomb Cyclone' Leaves Midwest Battling Floods A powerful weather system swept through the region, bringing blizzard conditions and leaving many communities with record-setting floods. At least two people have died. 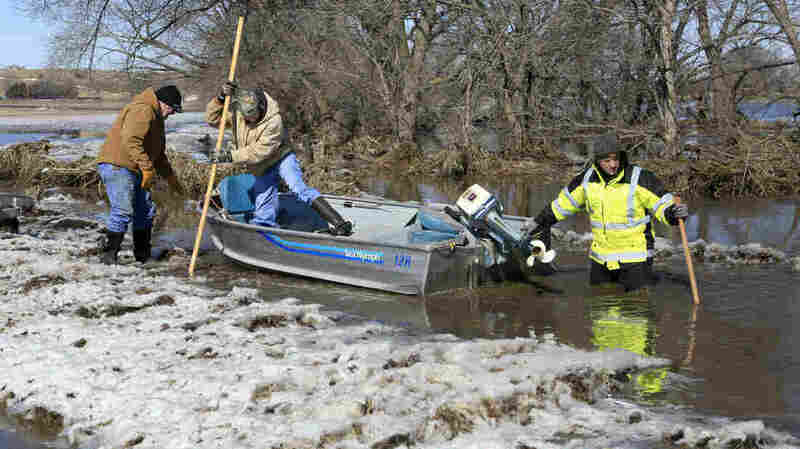 Tom Wilke, his son Chad, and Nick Kenny launch a boat into the swollen waters of the Elkhorn River to check on Wilke's flooded property, in Norfolk, Neb., on Friday, March 15. It's the worst flooding parts of the Midwest have seen in decades, where several states are battling the aftermath of a powerful "bomb cyclone" which swept through the region, bringing blizzard conditions, hurricane-like winds, snow and heavy rain. At least two people have died in connection to the flooding. In Riverton, in southwest Iowa, a 55-year-old man died Friday after the car he was in drove into a section of road that was closed. The car was swept away in flood waters and the man and two others inside were forced to swim, the Fremont County Sheriff's Office said. And in Columbus, Neb., a 50-year-old farmer died trying to help a driver who was stranded by floodwaters on Thursday, according to the Omaha World-Herald and other reports. The powerful storm pushed some waterways, including the Missouri River, to record levels in South Dakota, Iowa and Minnesota. Marc Chenard, a meteorologist with the National Weather Service, told NPR many areas will remain water-logged for days. "All the rivers respond differently, have different time scales that they flood and then recede. A lot of the rivers are going to remain in flood into the weekend, and some into next week," Chenard said. "Eventually as we head into next week, we should see more and more of the rivers start to recede below flood stage." Iowa, Wisconsin and Nebraska have all declared states of emergency. As rivers spill over their banks and through local communities, the rising waters are setting records. In Nebraska, Gov. Pete Ricketts said nearly every part of the state is experiencing historic flooding. Nebraska has experienced historic flooding and extreme weather in nearly every region of the state. Today, Speaker Scheer of Norfolk and I surveyed some of the flooding. Nebraska has deployed helicopters to assist in rescuing those trapped by the high waters, and boats for travel across washed out roads. CNN reported that some people who were rescued suffered from hypothermia and had to be transported to the hospital. The Omaha-Valley Weather Service office said a levee was breached in Nebraska's Dodge County. "This is an extremely dangerous and life-threatening situation," the weather service warned. "Do not attempt to travel unless you are fleeing an area subject to flooding or under an evacuation order." With flood waters rising, officials were monitoring for damage at the Cooper Nuclear Station, south of Omaha, which serves about half a million customers. Mark Becker, spokesperson for the Nebraska Public Power District told NPR the plant will continue operating for the foreseeable future. "If we get to the next threshold, the plant would go to a shutdown," Becker said. "A week ago, my backyard had a foot of snow in it. It's warmed up. The ground is frozen still. The snow is melting, and we've had some torrential rains, and that's created torrential flooding," Becker told NPR. In Wisconsin, Gov. Tony Evers said flooding was impacting "homes, businesses, and cities and towns" across the state. Lori Getter of the Wisconsin Emergency Management spoke with NPR. "We're trying to get a handle on the situation with the flooding across the state, but two days ago, and even yesterday, we were evacuating people because of the rising waters," Getter said. A bomb cyclone occurs when there is a rapid drop in atmospheric pressure. The massive storm moved into Canada on Friday. NPR's James Doubek contributed to this report.